Patrick O’Brian based our own dear Surprise in part on a real-life vessel of the same name. Throughout the series, O’Brian incorporated much of the real-life Surprise’s history into that of Jack Aubrey’s favorite command. An important part of the history of both the real-life vessel and the fictional one was the cutting-out expedition against the Santa Cecilia, formerly the Hermione. The kind members of the Historical Maritime Society break it down for us. 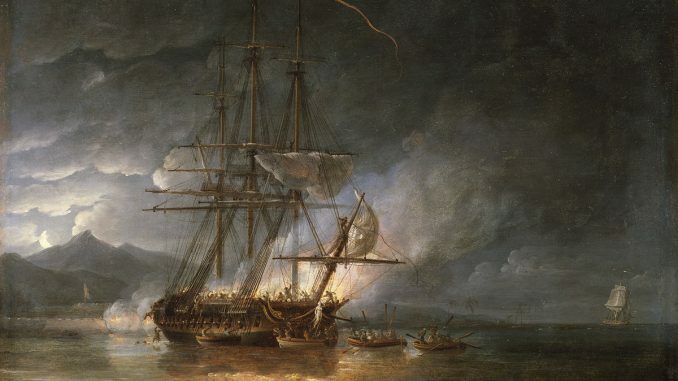 The Surprise, a 28 gun frigate had been sent by Sir Hyde Parker in October 1799 to re-capture the Hermione which had been handed over to the Spanish in 1797 by a mutinous crew. True, they had much to be mutinous about for the captain, Pigot, was a brutal flogger and a sadist. 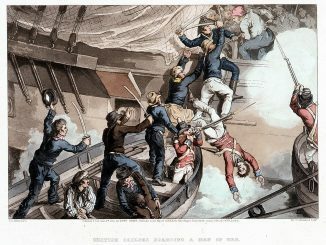 It was however the murder of Pigot and nine other officers by the mutineers which turned opinion totally against them and the navy had a very long memory where mutiny was concerned. Eventually the Surprise under Captain Edward Hamilton found her (renamed Santa Cecilia) in the Gulf of Venezuela at a harbour named Puerto Cabella protected by two gun batteries in the surrounding hills. Hamilton prepared to cut her out and the Hermione‘s bloody history ensured all the crew wanted to join the expedition. 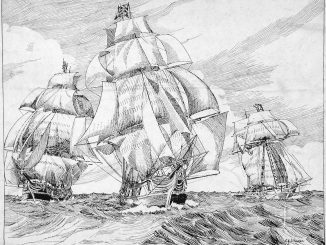 All the ship’s boats were employed and one of them was commanded by the Surprise’s surgeon M’Mullen who was to take his sixteen men and board over the larboard side, sending four men aloft to loosen the foretops’l. However the convoy was spotted and all hell broke loose on the night of the attack. M’Mullen’s men from the gig boarded over the larboard bow and M’Mullen having sent his topmen away led the rest along the larboard gangway for a rendezvous with Hamilton on the quarterdeck. Before he could be checked M’Mullen led his men in a wild dash for the starboard gangway where the Gunner was being pressed hard by Spaniards. A desperate fight occurred and it took some time before M’Mullen had defeated the opposition and had therefore cleared the upper deck of Spaniards. In all this Hamilton had been wounded and ordered his men together. He had fifty five men against the Spanish three hundred and sixty five, all of whom were below decks and firing up through the hatches at anyone who showed their face. He ordered his Marines under Lieutenant de la Tour du Pin and the sailors to fire together down a hatch and then leap down to the lower deck. This they did and by so doing cut the Spanish force in two. Sixty Spaniards were forced back towards the Captain’s cabin while the rest were forced forward. By now the other boats had cut Hermione’s anchor cable and were trying to tow her out. The Spanish batteries were firing grape and roundshot and succeeded in cutting the mainstay and wounding Hamilton for the fourth time. Eventually the ship was got under way and many Spaniards jumped from the gun-ports to avoid capture. Within an hour it was all over and the remaining Spanish surrendered. The red ensign was run up over the red and gold Spanish flag. The butcher’s bill was, at least for the British not too bad, twelve wounded and no-one killed while the Spanish had one hundred and nineteen killed and ninety-seven wounded. They also had one hundred and thirty-four prisoners. Hamilton was knighted for his gallant action while the officers of the Surprise bought M’Mullen a presentation sword in honor of his night’s work. He was also entitled to about £670 as his share of the prize money paid out when the Hermione was bought back into the King’s service for £16,095.15s9d. The name was also changed to the Retaliation. Sir Edward Hamilton was later dismissed the service for seizing a gunner to the shrouds. As a warrant officer a gunner could not be treated thus and should be court-martialled. Hamilton was later re-instated. M’Mullen’s fictional son, now a lieutenant in the Navy appears as the commander of the cutter Eclair which stops Aubrey’s Surprise near Norfolk Island in O’Brian’s The Truelove/Clarissa Oakes. In this it is made clear that Aubrey’s vessel is the same one that cut out the Hermione. 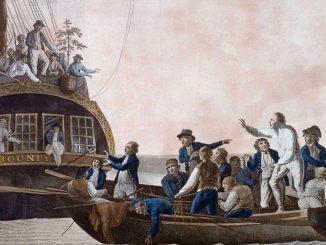 Aubrey was not on board her although he had been a ‘middie’ in her before the adventure and had been turned before the mast for smuggling a woman on board. The United States has a special history, and thus bears a unique stake, when it comes to the flight of foreign refugees, particularly those seeking sanctuary from oppression and violence.